Many readers were awakened at midnight Sunday evening by 12-18 shots fired in the Clarendon Park area, followed by loud calls from the street of "Someone call 911." Police arrived shortly and taped off the intersection of Sunnyside and Hazel. According to scanner reports on Twitter, one person was hit in the leg and ran into the building at 829 Sunnyside. There was also a car, which was occupied, that took four or five bullets, and the police were questioning the occupants. The initial reaction of the police was to contact the 24th District/Rogers Park police because "that's where the bad blood is." 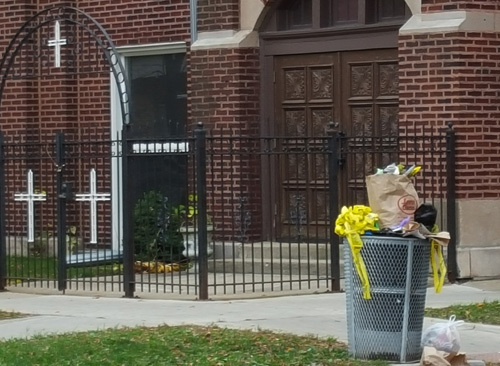 We surmise they're referring to the murder of an Uptown resident, a young man who was said to be a gang member, early Sunday morning in Rogers Park. Bad blood/revenge, it just never stops, and nothing ever gets resolved. We'll update if we learn more. Updated: The Trib's overnight crime report says, "Around midnight, a 24-year-old man was hurt in a shooting in the Uptown neighborhood on the North Side, Alfaro said. The man was on a sidewalk in the 800 block of West Sunnyside Avenue when someone fired shots from a passing gray sedan, Alfaro said. The man was hit in the right leg and was taken to Weiss Memorial Hospital, where his condition stabilized, Alfaro said. [...] Inside the crime scene, a parked Toyota Yaris stood with shattered windows on Sunnyside. About half a block east, a blood trail from the wounded man stained the sidewalk and was cordoned off by another circle of yellow crime tape."